Description Describes dermoscopyThe examination of [skin lesions] with a 'dermatoscope'. This traditionally consists of a magnifier (typically x10), a non-polarised light source, a transparent plate and a liquid medium between the instrument and the skin, and allows inspection of skin lesions unobstructed by skin surface reflections. Modern dermatoscopes dispense with the use of liquid medium and instead use polarised light to cancel out skin surface reflections. of string of pearlsCoiled or dotted vessels arranged in lines clear cell acanthoma pattern as seen in clear cell acanthoma(also known as "Acanthome cellules claires of Degos and Civatte," "Degos acanthoma," and "Pale cell acanthoma") is a benign clinical and histological lesion initially described as neoplastic, which some authors now regard as a reactive dermatosis. It usually presents as a moist solitary firm, brown-red, well-circumscribed, 5 mm to 2 cm nodule or plaque on the lower extremities of middle-aged to elderly individuals The lesion has a crusted, scaly peripheral collarette and vascular puncta on the surface. It is characterized by slow growth, and may persist for years. The clinical differential diagnosis includes: dermatofibroma, inflamed seborrheic keratosis, pyogenic granuloma, basal cell carcinoma, squamous cell carcinoma, verruca vulgaris, psoriatic plaque, and melanoma. String of pearls, Clear cell acanthoma String of pearls pattern – cite! String of pearls pattern (message) String of pearls pattern – participate! This pattern represents the unique appearance of dotted or glomerular vesselsThis glossary term has not yet been described. 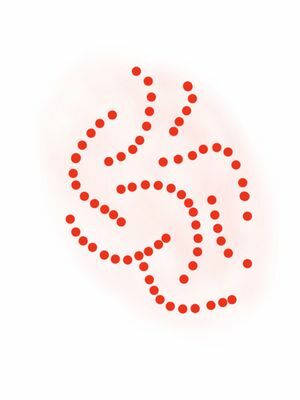 arranged in a serpiginous distribution that may appear like a “string of pearls.” This pattern is highly suggestive of a diagnosisis the identification of the nature and cause of a certain phenomenon. Diagnosis is used in many different disciplines with variations in the use of logic, analytics, and experience to determine "cause and effect". In systems engineering and computer science, it is typically used to determine the causes of symptoms, mitigations, and solutions of clear cell acanthoma. ↑ Marghoob & Braun: Proposal for a revised 2-step algorithm for the classification of lesions of the skin using dermoscopy. Arch Dermatol 2010;146:426-8. PMID: 20404234. DOI. This page was last modified on 16 January 2019, at 23:20.